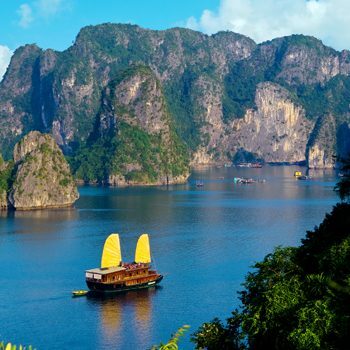 Halong Bay attracts travelers with not only its splendor and charm but also many interesting activities during your tour. For many travelers who are interested in adventures, a Rock– Climbing tours in Cat Ba Island will be an ideal choice when traveling in Halong Bay. Nowadays, on Cat Ba archipelago, there are 8 points trekking in Cat Ba and some other points of Halong Bay tours operators venturing into climbing Cat Ba. Most climbers are now tourists from Western countries and their main object is to explore much adventure tourism and trekking in the island of Cat Ba and Halong. 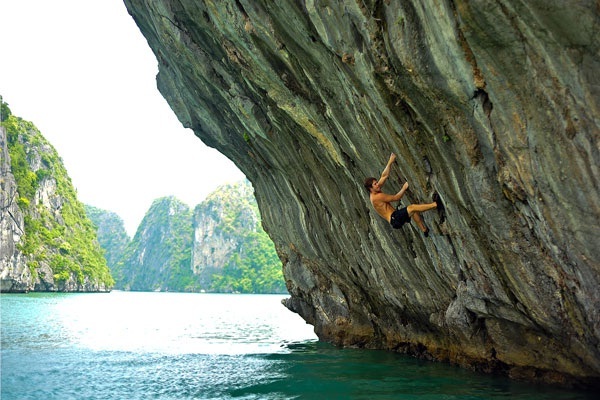 There are many best climbing routes in Cat Ba which are accessible at high tide. Topography and water depth here is suitable for free climbing on the sea. Or cliff right is next to Beo wharf, one of the main port of the island of Cat Ba, place of origin of the tourist train visit Lan Ha Bay, adjacent to Cat Ba town. 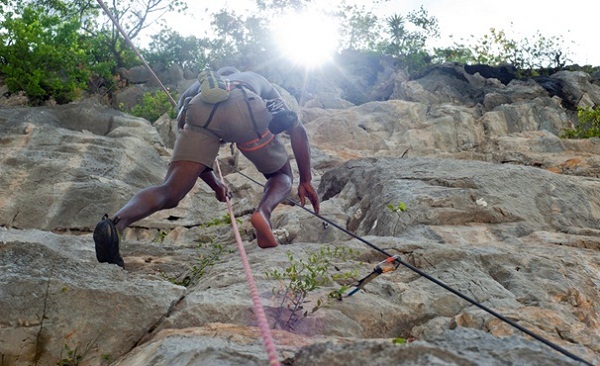 Cliff climbing routes here are 5. The quality of the cliff is very good, but difficult to climb as the summer can be slippery, sticking more difficult. On the other hand, people should climb to the cruise begins at the foot of the wall can sometimes be problems instruments or objects. Be prepared good health, especially psychological and contact travel agencies, tour equipment to climb, especially utensils and necessary advice of professionals before joining climb Cat Ba Mountain. Just a scenic thirty-minute motorbike ride from Cat Ba Town is beautiful Butterfly Valley which is located in Lien Minh, the oldest village on Cat Ba and one of the most pristine areas on the island. The valley wall is a magnificent cut of superb limestone with over 50 sport routes available. Climbing grades range from 4 to 8b+… plenty of routes for climbers of all levels. Alongside Ben Beo Harbor is Ben Beo Wall, featuring 5 challenging climbs from 7a-7c+. 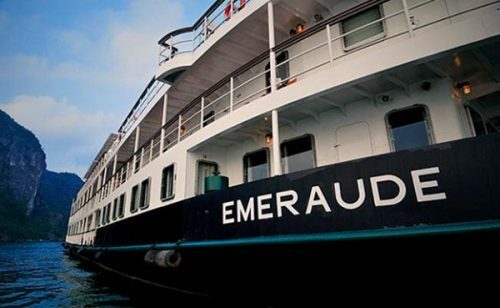 The tops of these climbs overlook the entire harbor, providing an amazing view at sundown. Ben Beo is the closest place to climb to Cat Ba town and great for an afternoon or morning. 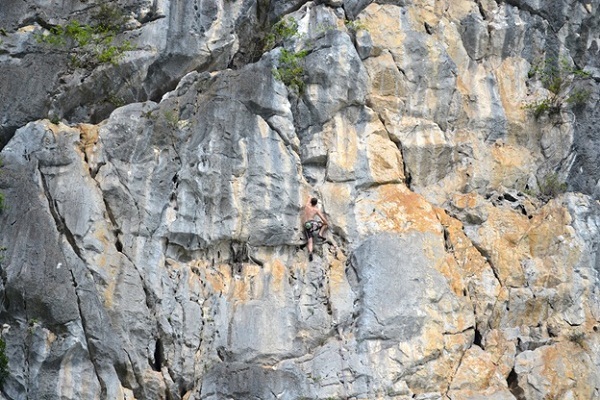 Enjoy Rock – Climbing tour and the most comprehensive information and services for rock climbing in Vietnam! There is no better way to get high in Vietnam than rock climbing over the turquoise waters of Halong Bay.